I really have no idea what these are actually called! I’m calling them Laurel Wreath Drops, as they are made up of tiny Oval Laurel Wreaths that are all hooked together and drop down, with a Bow on the top. I think they are so pretty! These would be so useful for Handmade Cards, Scrapbooking etc. In Other News: Stop by my DIY Blog to grab the full size (and reverse option) of this French Franc Transfer Printable! Black And White Ornamental Image! 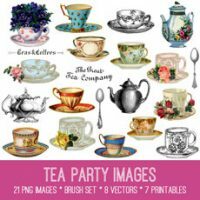 Tea Party Images Kit! Graphics Fairy Premium Membership Vintage Ornate Ornamental Border Graphic! These are so pretty…thank you!! I could definetly use this wreath in decorative painting! Thanks ladies, I’m glad you can use these! So pretty, these could be useful in so many holiday projects. Lovely as bookmarks or tags for gifts. Lovely images thanks Karen – bookmarks are a great idea for these. Thanks everyone! I love the bookmark idea! !